20 Tips from (more than) 20 Years! How to Deliver Powerful and Persuasive Presentations ... with Pizzazz! This eBook is jam-packed with practical, easy to implement techniques that wll transform your current presentation skills! 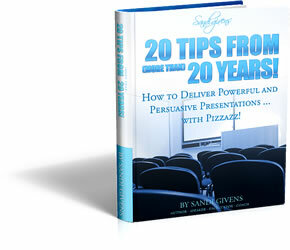 "Hello again Sandi - This week I gave my first presentation since reading your book 20 Tips from (more than) 20 Years – How to Deliver Powerful and Persuasive Presentations ... with Pizzazz! and it made such a difference to my presentation as well as my stress levels. Your book is so comprehensive and practical. I was able to prepare more effectively, know what to leave out and what to include, and even helped me stay calm when there was a technical glitch! It really is a must read for anyone who wants to master the art of presenting to a group." Never run out of time again! Manage the unforeseen with grace and aplomb! If you're involved in sharing your knowledge, presenting to meetings, making sales pitches, speaking at conferences ... even making speeches at weddings and family events - this eBook is a must for your library! In researching this topic over many months I asked my clients “What keeps you from feeling more confident more often?”. 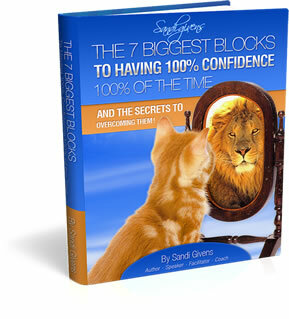 I discovered there are seven common blocks to confidence and this eBook covers strategies to deal with each of these in detail. Whether you fear failure, are concerned about causing conflict if you speak your mind or are worried about job security, there are answers in this book. Complete with strategies for individuals as well as for organisations that want to create more positive cultures for their staff, this eBook will provide you with tangible and practical ideas that you can implement immediately! We all need a lift now and again. Life can wear us out, deplete our energy and somehow shrink our spirit. 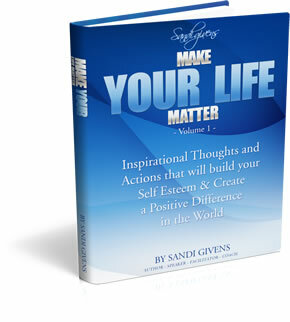 I wrote this book for those times when we need some uplifting reading, an idea that will stir our consciousness and raise our spirits. Under different subject headings such as ‘What it means to be Courageous’, ‘Know your Worth’ and ‘Uncommon Teamwork’, inside you’ll find 25 inspirational quotes along with several paragraphs from me about how you can apply the wisdom these contain to your daily life. A great ‘pick-me-up’ from when you – or a friend – needs it most.